Paeonia Shirley Temple is a celebrity with a worldwide fanbase. A real favourite on the Dutch market, where it regularly can be found in lists of top ten most traded peonies. 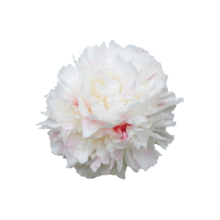 The peony often starts with a pale pink colour, but becomes completely ivory white during blooming. Because of its small to mid-sized flowers it’s well suited for bouquets. Shirley Temple makes every show a great success. Shirley Temple thrives best in countries with an abundance of sunshine. Hence it can be a challenge in a country like The Netherlands where sunshine comes at a premium. But for great growers it can be done, and it’s well worth it to work a little bit harder for this beautiful peony. This peony is named after the famous American actress, Shirley Temple, the youngest Oscar winner ever. However the breeder is uncertain, we think he did a great job. Especially in Chile we can clearly see the quality’s of this variety. Dispaly the peonies in lukewarm water after cutting the stems diagonally. Then add some sugar or flower food to the water, turn on the spotlights and it’s showtime! We also have a tip for growers, Shirley Temple can be hard to grow because she is vulnerable for Botrytis. Therefore it might be wise to check your humidity in advance.